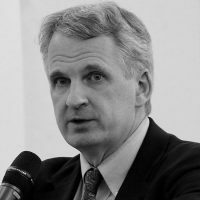 Timothy Snyder is the Richard C. Levin Professor of History at Yale University and a Permanent Fellow at the IWM (Institute for Human Sciences) in Vienna. Among his publications are five award-winning books. Bloodlands: Europe Between Hitler and Stalin, a history of Nazi and Soviet mass killing on the lands between Berlin and Moscow, received the Hannah Arendt Award for Political Thought, the Leipzig Prize for European Understanding and the Ralph Waldo Emerson Award in the Humanities.